Here in southern Oregon signs of spring are everywhere, even though there is still a chilly nip in the air in the mornings and evenings. The official first day of spring is tomorrow, and so I bring you this review of a book that is sweet and deliciously funny! Happily Mr. Squirrel scampers this way and that. He finds delicious things to eat, gorges himself, and then naps in the sun. However, Hedgehog has no appetite for food or frolics. He has been to the pond where he espied a lovely lady hedgehog. Unfortunately, he was so terrified of the gorgeous creature that he fled. Luckily Mr. Squirrel is there to help Hedgehog. 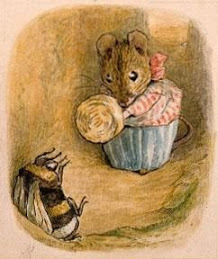 He tells Hedgehog that he needs to “gain fame and glory” to earn the lady hedgehog’s esteem, and the best way to do that is to show off how brave and strong he is and to win lots of fights. The thing is that to win fights you have to look suitably dangerous and intimidating. Mr. Squirrel quickly gets to work. He measures Hedgehog and then runs off to gather supplies. He is going to make his friend look tough and masterful. It takes a while to come up with the right costume but in the end he succeeds. Not only that, but he too dons a similar costume so that he can help Hedghog win a “dangerous fight.” Now all they have to do is find an opponent who will make them look good. 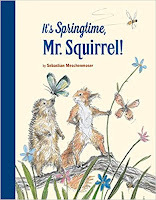 Children are going to laugh out loud as the follow the adventures of Mr. Squirrel and his friends. Who knew that winning the heart of a lady hedgehog could be so hard? Who knew that spring could be so full of surprises? With its delightful animal characters and its surprising ending, this is a wonderful book to share with children. 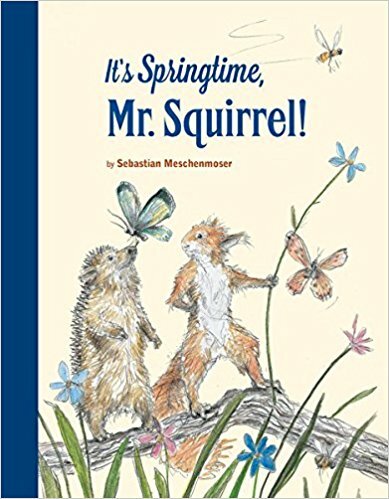 Adults will find it hard not to fall for Mr. Squirrel, who is such a good friend.